Michael Slager won’t face death penalty for Walter Scott shooting. 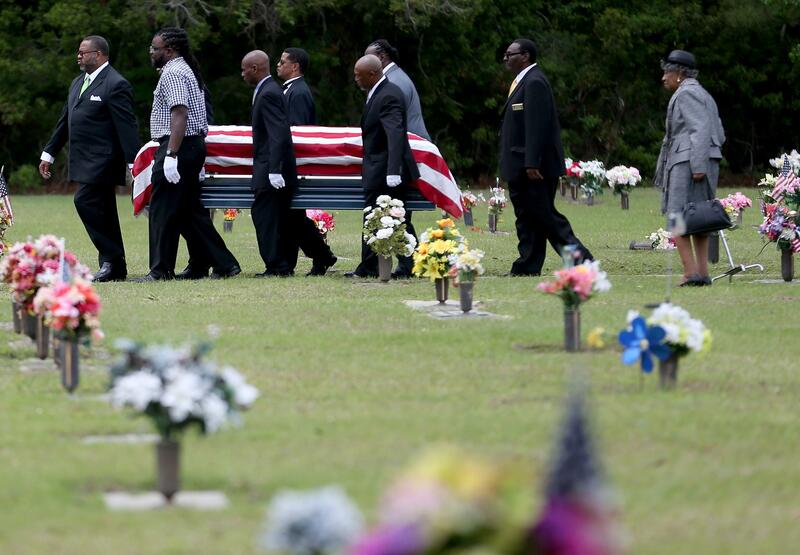 The coffin of Walter Scott is carried by pallbearers to his burial site on April 11, 2015 in Charleston, South Carolina. North Charleston police officer Michael T. Slager will not face the death penalty for Scott’s death. South Carolina police officer Michael Slager will not face the death penalty for shooting and killing Walter Scott, the local country prosecutor, Scarlett Wilson, said on Monday. “Based on the facts revealed thus far, it does not appear South Carolina’s death penalty provision applies in this case because there are no statutory ‘aggravating circumstances’ present,” Wilson said in a statement Monday. Slager was charged with murder for firing eight shots at Scott as he was running away, and is currently in jail. In the first recording, an unidentified officer talks to Slager about what might happen. “Once they get here, it’ll be real quick. They’re gonna tell you, you’re gonna be off for a couple days and we’ll come back and interview you then. They’re not gonna ask you any type of questions right now. They’re gonna take your weapon,” the officer says. “It’d probably be a good idea to jot down your thoughts about whatever happened … once the adrenaline stops pumping.” Slager responds: “It’s pumping,” and then laughs.